It's truly hard to find words to explain an event like that of the Tesla Model 3 handover party, but now that we are finally back to reality, we are so eager to share. It only makes sense to preface this post with a bit of a disclaimer. We here at InsideEVs don't often write personal accounts, share stories in first-person, or spend time on details that don't include information like vehicle announcements, battery size, EV range, emissions-free living, etc. However, you all deserve to be a part of the experience that Bria and I had this past week, and we have been chomping at the bit to share. 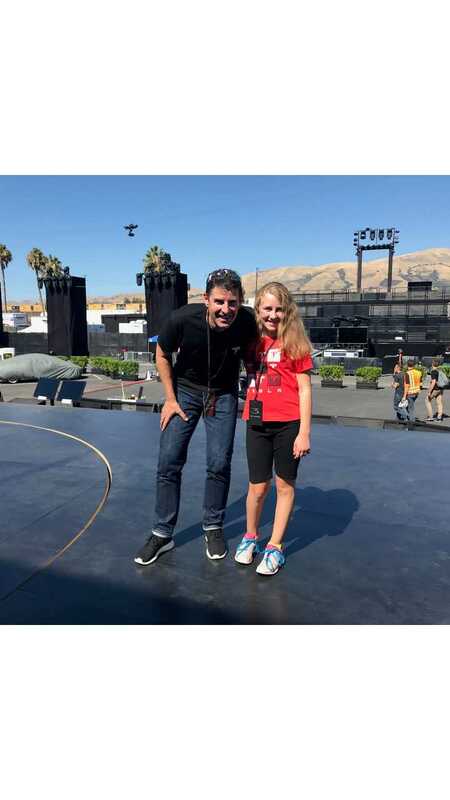 Bria Loveday hours before the Model 3 event with Tesla President of Global Sales and Service, Jon McNeill. About a week ago, we set off on a family vacation from our home near Detroit to a relative's home in Connecticut. 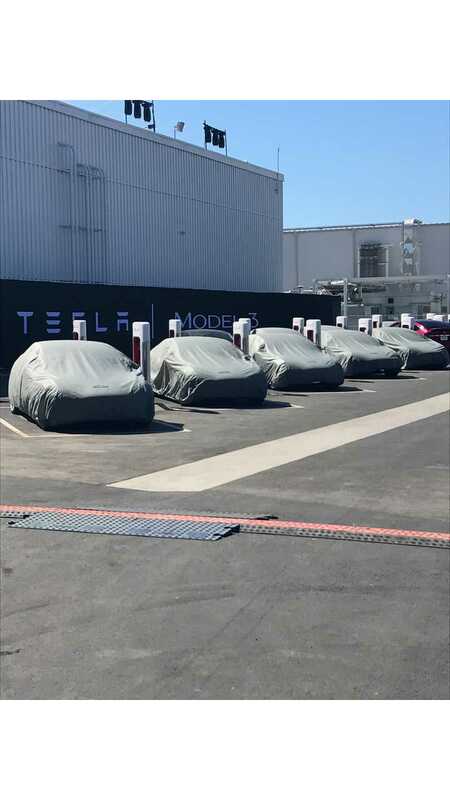 After some 14 hours in the car we were able to enjoy a few days of sightseeing and sailing, before departing for our trip-within-a-trip, to Fremont, California for Bria's participation at the Model 3 event (full details here). Upon departing for California, we knew very little about what Tesla's plans were to include. I should share that neither of us have ever spent time on the East Coast, and when we learned that we would be heading to the West Coast in the same week, we were elated and perhaps a bit overwhelmed. Neither of us had ever been to the West Coast either, as our westerly travels have only taken us as far as Chicago. Bria has never even been on a plane, and we ended up on four planes inside of 24 hours (talk about bucket list material here)! Inside of a mere handful of days, we found ourselves having driven for 46 hours, spent 12 hours on a sailboat, 15 hours in the air, six hours in various airports, six hours in a Tesla Model X, eight hours at the Tesla factory in Fremont, only a few hours at the actual event itself, and about three minutes in a Tesla Model 3. We departed our relative's home in Connecticut at 3:30AM on Friday, July 28, and returned at 7:00PM on Saturday, July 29, having slept a whopping 2.5 hours, and then drove the 14 hours back to Michigan. Needless to say, Bria is still out of sorts. Now that all the background information is behind us, let's talk about our time at the Tesla factory in Fremont. Upon our arrival at the San Francisco International Airport (yes we should have flown into San Jose, but that's a whole other story), we didn't have a very clear picture of what was supposed to happen next. 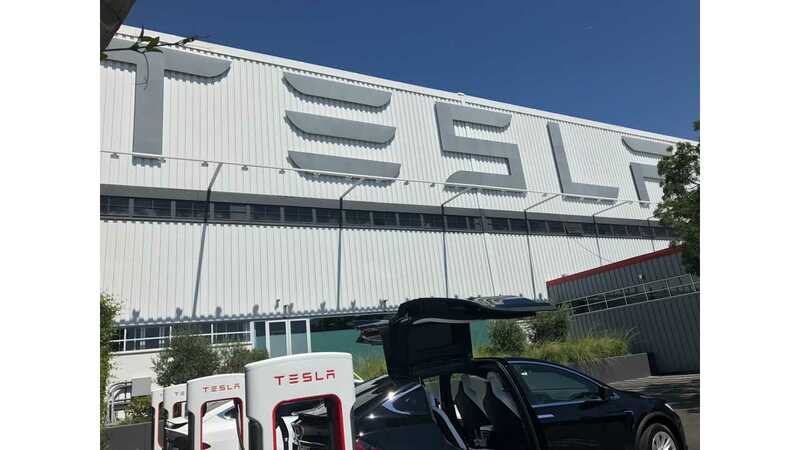 We planned to spend the day together touring San Francisco and relaxing until the event, but we didn't have a firm grasp regarding what Tesla had planned. It took about two hours of tooling around the airport and sorting out details, but eventually we made our way to the first of two hotels, and were picked up by our lovely host, Brenda, in a brand-new, black Tesla Model X 100D (with marshmallow interior, according to Bria). It was surely the ideal vehicle in which to be chauffeured around the Bay Area. Our lovely host, chauffeur, nanny, and beautician, Brenda. Brenda said that she was at our service indefinitely, and that we could choose to do whatever Bria wanted ... sight-seeing, shopping, eating, all complements of Tesla. 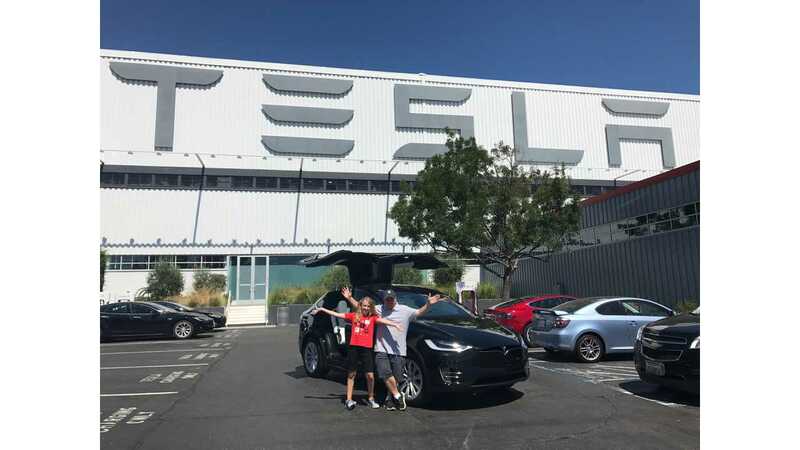 Unfortunately, due to the traffic in the area, it wasn't possible to do very much, but we enjoyed the scenery, tried In-N-Out Burger for the first time, and made our way to Fremont to begin to take in the spectacle that is the Tesla factory. We were promised that we could continue to do whatever we wanted after the event, and for the entire remainder of the weekend. Sadly, we were set to leave our hotel at 4:30AM the next morning, so our festivities would be limited. We finally arrived at the Tesla factory in Fremont, California. Way too many photo ops! I will spare you the hundreds of random pictures. At this point -- about five hours ahead of event time -- we were obviously wondering why the heck we needed to be there so early, and already thinking of what an impossible task it might be to make our way back to San Francisco, eat, shower, change, and then return by 7:00PM. It turns out Tesla had very different plans. Bria spent about an hour rehearsing for the evening's festivities, meeting Tesla's top brass and just about everyone else involved with the event, and thoroughly enjoying the attention. 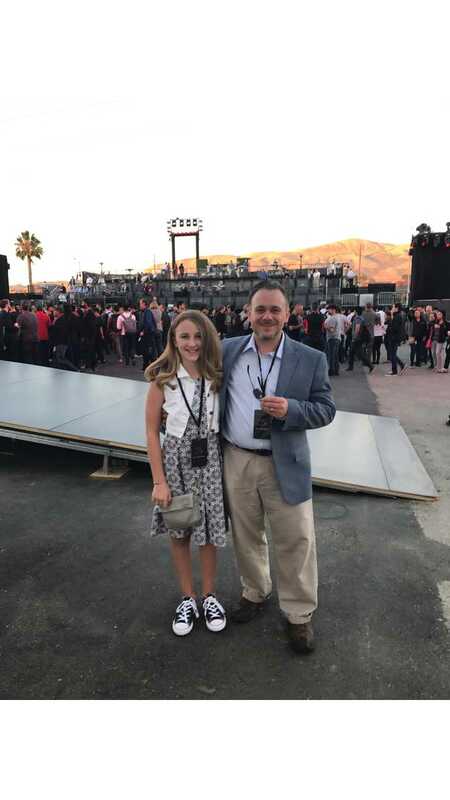 Tesla's President of Global Sales and Service, Jon McNeill, spent a bit of time with us and talked at length with Bria. He even offered to take her on a personal one-on-one private factory tour. Little did Jon know that the event organizers had already planned for this. Shortly after our time with Jon, we were fortunate to speak with Tesla's head designer, Franz von Holzhausen, who was just as personable and gracious as Jon and every single other Tesla employee and executive we had the pleasure to meet. 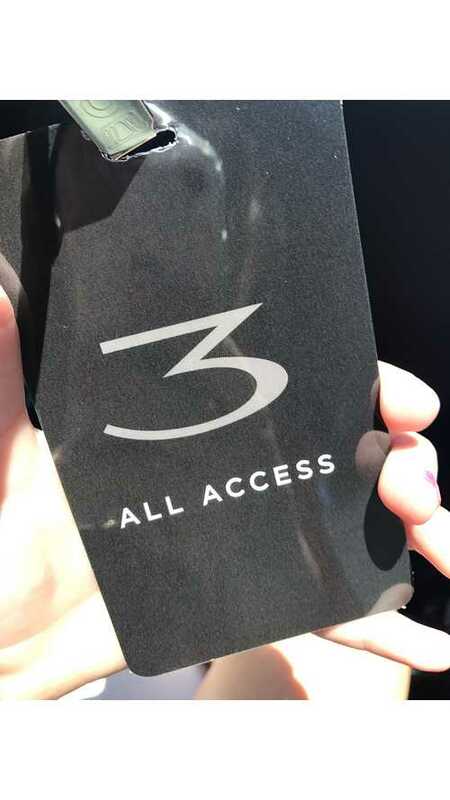 Following Bria's rehearsal, Adam Slusser (the event host) took us on an in-depth private factory tour, during which we were able to watch the Model 3 being built. There was no one else on site at the time other than employees, so we had the whole place to ourselves. Adam is a veteran Tesla employee, and one of few who can say that he's been there over eight years. Not only did he know every trivial detail about the factory, but he was super-animated and explained everything in a way that was exciting and understandable to a now hot, tired, and irritable 11-year-old girl. Out in front of the Tesla factory before the event, juicing up the Model X.
I will be honest to say that watching car manufacturing is not on Bria's list of favorite things, and prior to word of the tour, all she really wanted was to get to our hotel room, change, and relax (and then go see the Golden Gate bridge and eat seafood). Nonetheless, due to Adam's superb delivery, it turned out to be one of the most fascinating and memorable experiences Bria and I have ever had. She truly didn't want to leave the factory. The fact that Musk has named many of the robots after Marvel comic book characters upped the ante. The factory was impeccably clean and organized, the workers were all very friendly and seemed to be in high spirits. The factory's immensity and level of automation were such that it's hard to even put into words. It was surely a life-changing experience ... surreal and otherworldly are two words that come to mind. If I didn't admit that I was on the cusp of being choked up at least once, I would be lying to myself and all of you. 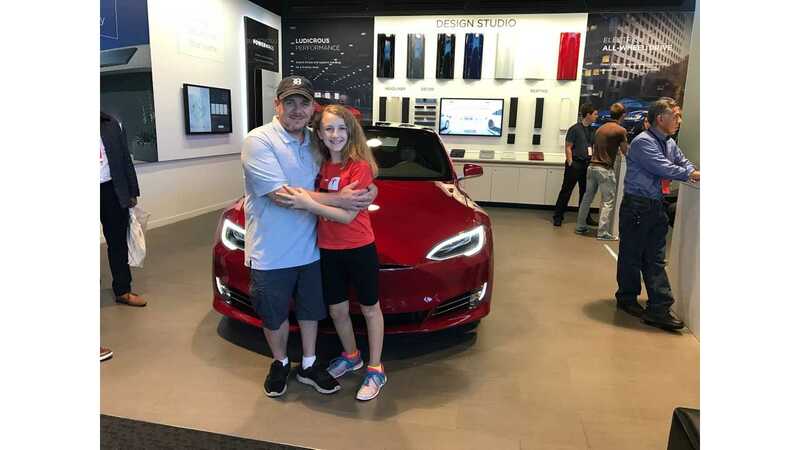 Even more moving was the point at which my 11-year-old daughter was wiping away joyful tears that she couldn't quite comprehend, as Adam conveyed Tesla's vision and talked about the future. 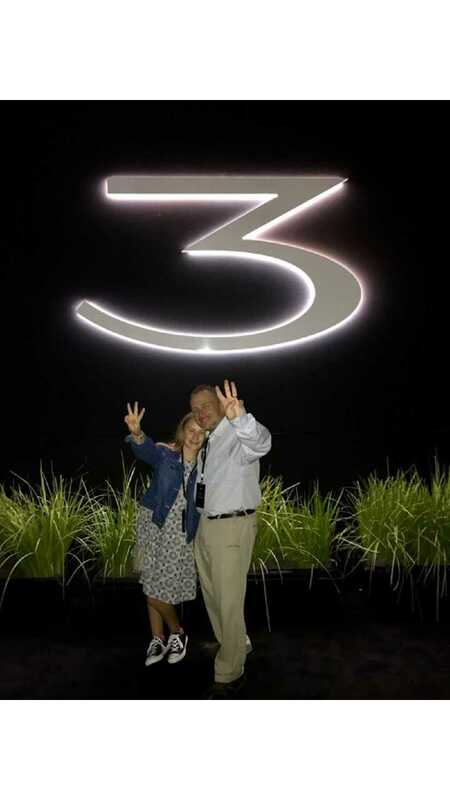 After the factory tour, we learned that Tesla's Senior Director of Global Marketing, Colette Bridgman, had booked us another hotel room next door to the factory. A beautiful Marriott with room service, of course. Colette -- who's one of the most genuine and accommodating people Bria and I have ever met -- is the Model 3 event's master planner, and one of few Tesla employees with more years in than Adam. We were provided with more food than we could eat, a bit of time to chill, and then our host Brenda returned to iron our clothes and do Bria's hair (yes ... Brenda is also a certified cosmetologist). Once the hairdo was in order, our plans to be at the event at its 7:00PM starting time was definitely not happening. We had already enjoyed the opportunity to see everything well ahead of everyone else, and we had already eaten. 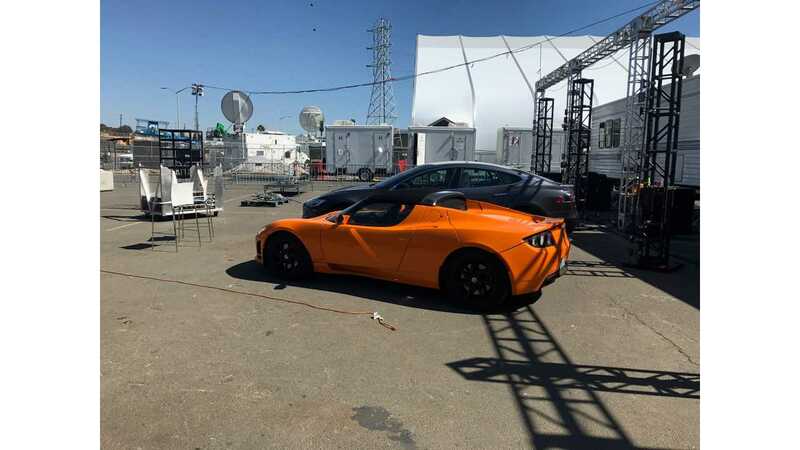 So, Tesla just planned to deliver us to the event in time for Bria's stage appearance. A shot of the party area prior to the event. Another pre-event look at the site. Another shot prior to the show. 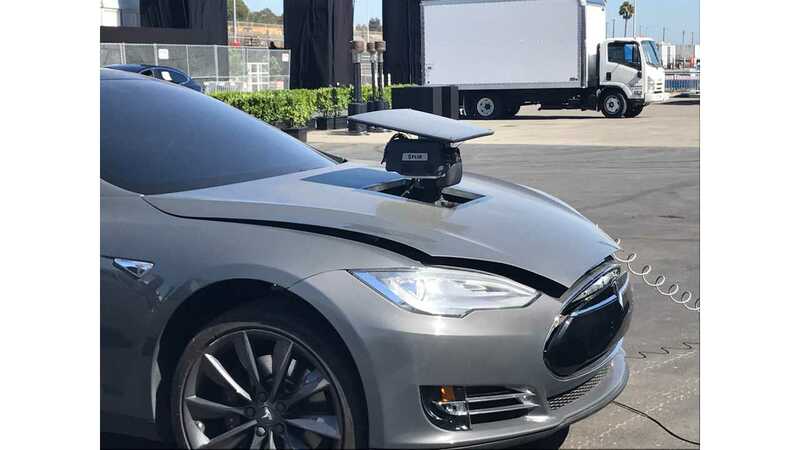 Meet the infamous Tesla Model S with a built-in projector system and an emissions-detecting infrared camera. When we arrived at the event to see huge lines of people (about 6,000 to be precise), it was an incredible site. What had been a bright, sunny, quiet, and mostly empty space just a few hours prior, was now cool ... sunlight was fading, and the space was full of music, people, and positive energy. Bria and I arriving at the event prior to her taking the stage. The event went on as planned. 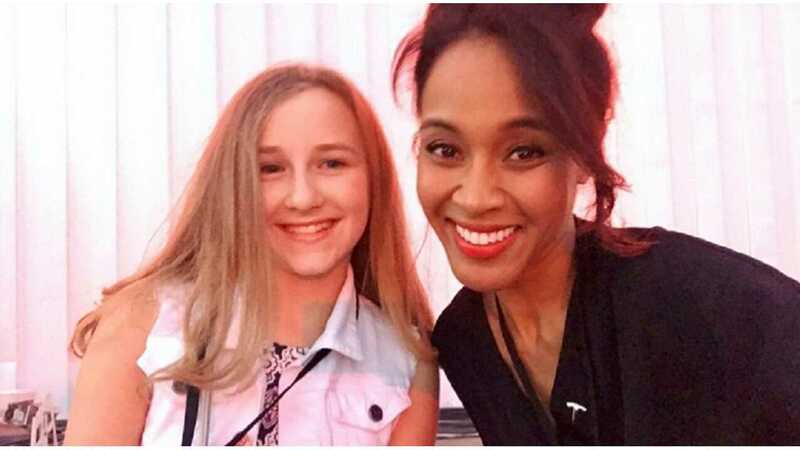 Bria had a successful stage debut, and an opportunity to meet Project Loveday winner, Marques Brownlee (MKBHD), and the first 30 Tesla Model 3s were "handed over" to their rightful owners. We had heard some talk of Model 3 "drives", or at least maybe rides, but it was getting late and there was a list of several hundred people ahead of us. Apparently, they had all signed up during the time that Bria and I were off site or occupied. We were disappointed, but we accepted the fact that we had missed the opportunity. Bria announces "Project Loveday" from the stage with Adam Slusser, the king of factory tours! 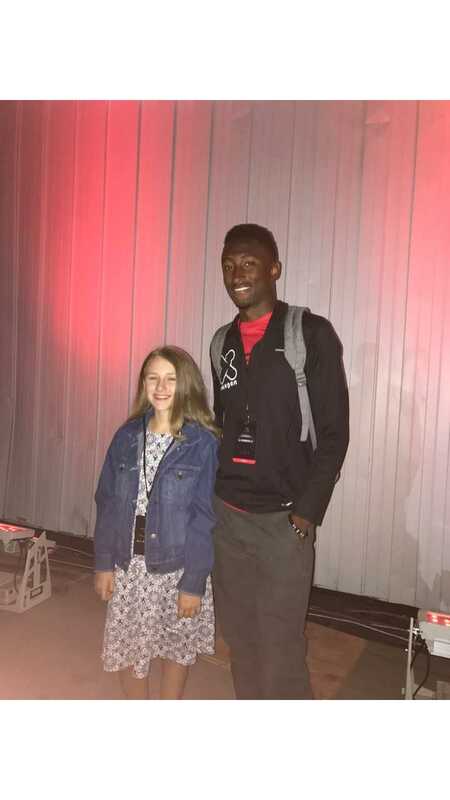 Bria with Project Loveday winner Marques Brownlee (MKBHD). We were beyond exhausted and still had big plans to explore San Francisco. Brenda and I had promised Bria a look at the Golden Gate Bridge, Alcatraz, and Fisherman's Wharf, along with the seafood she'd been waiting all day for. While it would have been so nice to crash at the Marriott next door, it was nowhere near the airport and we had luggage and a rental car across the bay at the first hotel. Upon departing the event we were told that there was a spot for us at the front of the long line waiting to take a ride in the Model 3. I will say that it felt a bit awkward and wrong to walk past 400 some people, especially since I teach my children that it's wrong to cut. But, we had a very long day and everyone was extremely understanding and urging us to move forward. I've learned that having the Project Loveday girl with me tends to make such situations less obtrusive. Though I didn't get a chance to personally operate the vehicle, it's safe to say that Bria and I were beyond impressed. Bria sat up front, even though I told her that it may be a bit tight in back for Michael and I (Michael Beinenson contributes at InsideEVs and was gracious enough to give of himself to capture exclusive photos and video of the event, since Bria and I were to be kept very occupied). Surprisingly, the rear seats were roomy and supportive. The lack of a traditional instrument cluster was a non-issue. Having the driver information at the top left of the touchscreen made for easy visibility. We didn't drive far enough or fast enough to get a good handle on the car's performance, but the ride was incredibly smooth, and despite the tight course and many obstacles, including pylons and people, the Model 3 proved exceptionally nimble. Bria and I were crazy tired after the long day, but Brenda was wide awake and ready to chauffeur us back into San Francisco to see the sights in the wee hours of the morning. During the time that we should have been sleeping, we made it all the way back to the northern reaches of the Bay Area and Bria got to see the Golden Gate Bridge, Alcatraz, and Fisherman's Wharf, among other things. We even enjoyed a trip down twisty Lombard street before getting our much-awaited seafood and heading back to the hotel. What an exemplary end to a fantastic trip! To say that Bria and I could share all day (and then some) about the details of our day at Tesla and the event would be an understatement. 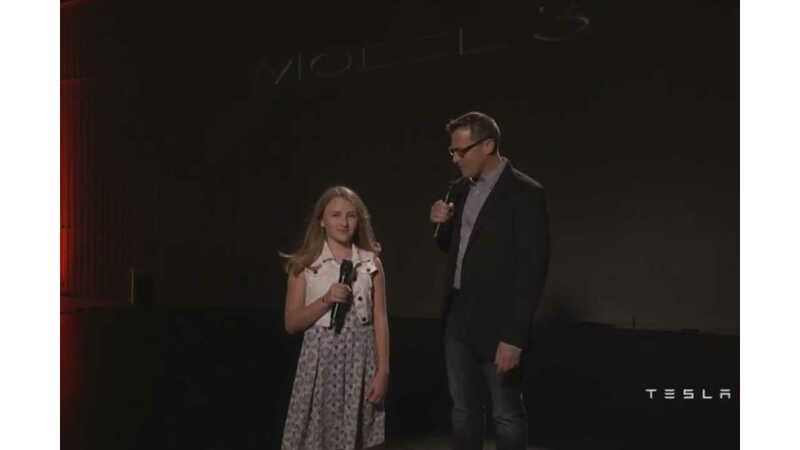 The way that the people at Tesla handled everything, the opportunity that they gave a young child, the impact that it made on her, our family, her friends, and myself will be something that we will all remember and cherish forever. All this from a simple bit of homework and a response from class-act CEO Elon Musk (who we regrettably missed our opportunity to meet). Our last photo op before departing the Tesla factory. Tesla makes things happen, and according to Bria, more companies should act as Tesla does, and other CEOs should take note of Musk's actions. We felt like part of the Tesla family and part of something very special from the moment Brenda pulled up at our hotel and took us under her wing (and the falcon wings). This was all despite the fact that our best laid plans had changed and we didn't really have any clue as to what was ahead of us. We exchanged numbers with some very kind and incredibly special people, and have already been in contact since the event. It's not about Tesla the automaker, but instead it's about the people behind it and their approachability, their attitude, and their shared vision. Thank you all for being such an amazing audience and supporting us here at InsideEVs and "fueling" the growth of EVs. Hopefully, our ability to share our experience will work to move you on some level, because being a part of it all moved us inexplicably. And with that, it's time to sign off. Check out the handful of very "amateurish" photos that Bria and I were able to shoot with our phones whenever there was a moment to spare.